Sheila and Joel are convinced she murdered Carl (and I was too), so they set out trying to cover their butts for that... when who should show up at work, but Carl? That’s a relief for them, especially since Carl may be awful but he doesn’t rise to the level of “rip his throat out” evil. Sheila does take her moment to stand up to him about having her own opinions and he promptly fires her and gives the pitch meeting to Joel. Joel can’t do anything but stand there in shock, which Sheila gives him grief for later. She’s struggling pretty hard with losing this part of her identity. Not only can she not be simply a killing machine, but she likes working with Joel and now they don’t have that partnership anymore. He points out that he can’t quit his job too because they can’t afford to have both of them unemployed, which is especially true in a Los Angeles suburb, but eventually he comes around to realize that it doesn’t matter—he and Sheila are a team and they stick together. Hammond Realty is born and I’d be lying if I said I didn’t tear up a little when he produced the business card. On the way to this realization, Joel and Sheila find out Sheila interacted with Lisa and Anne the previous night, encouraging Lisa to get baptized because Anne is super religious and encouraging Anne to use the creative side of her brain instead of focusing on work all the time. When Abby finds a dead Nazi in their freezer, they now know who the heart belongs to and just need to track down the kill site to make sure there’s no incriminating evidence. The kill site in question is Nazi guy’s towing company employer, where Sheila did a stellar job of cleaning up after herself. The only thing left to do is erase the surveillance tape and get her boot from the towing company’s doggie. Easy peasy! Though watching the video does give Sheila some insight into just how disturbing it is what she does; she feels like a monster and wonders if she should be around people at all. Joel reassures her that she’s not a monster (and she’s really not), but at least she knows better what Joel and Abby have been dealing with this whole time. Meanwhile, Abby is ready to vandalize the fracking site, she just needs Dan’s old night-vision goggles to pull it off. When she asks Lisa for them, Lisa’s trade-off is that she gets to make Abby up for her “date” with Eric. This is a movie/TV trope I’m not as into as the piecing together a hazy night. Liv Hewson is perfectly lovely without makeup (well, makeup other than the stuff actors have to wear for filming’s sake). However, makeup is designed to enhance your looks and I do understand that feeling extra pretty is nice sometimes. It’s also very telling that Lisa calls it Abby’s “war paint.” The two of them share some nice moments of Lisa telling Abby what a great girl she is, just like her mom. Still, I was kind of hoping Eric would see Abby in all that makeup and be turned off by it, telling her he likes her better without it. Ah well, can’t win ‘em all. But what he does tell her is that he’s not actually down with all these criminal hijinks. He’s just not that guy. She’s pretty disappointed, but I think she’ll come around to realize that’s not her either. I’m all for protesting fracking, but Abby’s ideas are a little much for a teenager to pull off and not get herself (or someone else) hurt. The poor girl just doesn’t know where to direct her anger and pent-up intensity; I feel like a confrontation is coming between her and her parents before the season ends. Oh, and Anne’s relaxation painting time is called “Suspicious Objects: A Series” and includes Gary’s finger, a missing Nazi, where’s Dan? and a nervous neighbor (Joel). The net is obviously closing in, but the Hammonds can’t just kill Anne like they killed Dan. She’s a little intense, but she’s a good person. I’m very curious to see how they solve this particular problem. Why have we not revisited the Ball-leg Knights? That happened two episodes ago, what have they been doing? If they don’t reappear until the finale, I’m going to be pretty irritated with the pacing of this particular storyline. Timothy Olyphant’s delivery on “It’s new and I love it” was very funny. 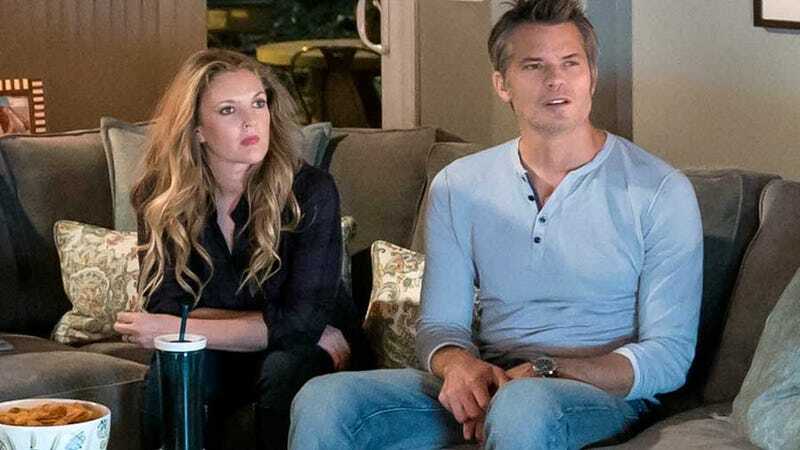 I knew Drew Barrymore could do comedy, but I honestly wasn’t sure about Olyphant going into this show. He has been a delightful surprise as the harried suburban dad.